I’d like to report about a fun science adventure Zoe (my girlfriend and science companion extraordinaire) and I had a couple of years ago. We had heard from a variety of sources that there was a hallway in the East Bridge building on the Caltech campus where all of the old wagers between Professor Kip Thorne and other scientists were hanging for all to read. We wanted to see this for ourselves and take some photos. One weekday afternoon, Zoe and I took off in search of physics lore. It’s always fun to go hunting for physics tradition. We found the hallway right off. It was just down the hall from Professor Thorne’s office. We were in the hallway looking over the framed wager documents when an unknown person walked by and said “Someone has a serious gambling problem there!” We died laughing. How appropriate. It was curious to discover that Professor Thorne’s favored form of payment in the event he won several of the wagers was a year subscription to Penthouse magazine – many interesting ramifications there. We studied the half dozen or so wagers, took photos of each one, and then sauntered off together to ponder over what we had just experienced. 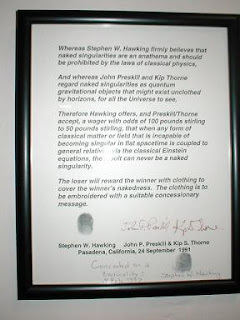 It was great to witness the playful antics of some of the world’s most preeminent scientists including Stephen Hawking, John Preskill, and S. Chandrasekhar. We certainly found much evidence of curious characters that day. hi, i'm in chicago, i would love to see those bets on the wall. is there any where i can download pix of them all?